When it began operations way back in the year 1986, it was among the smallest metro networks in the world. Now, the Rotterdam metro runs on 5 lines, serving a massive number of 62 stations. From measuring not more than 6 km in length, the system now covers more than 78 km. 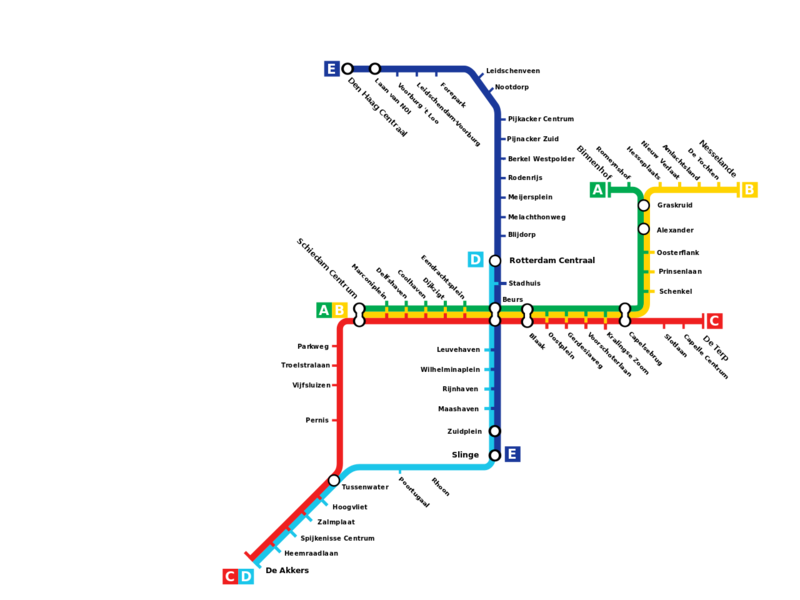 This metro system has been growing. It started off as the first metro network in the entire city of Netherlands and now it has an annual ridership of 86 million (2015). The RET are the responsible owners and operators of this important network in the city of Rotterdam, Netherlands. Map of Rotterdam Metro showing its lines and stations. Click on the map to enlarge it or download Rotterdam Metro Map in PDF. The metro operates at different times, on different days. However, primarily it begins operations at around 05:00 am in the morning and runs for a while after midnight till around 01:00 am. The main means of payment for the tickets is via an OV chip-card. A passenger can purchase a ticket for two hours for €3.50, while there is also an additional ticket option that allows a passenger to use the ticket twice. This ticket is priced at €6.00. For tourists especially, there are 1, 2 and 3 day tickets also available. The price of them being €7.50, €12.50 and €16.50, respectively. These tickets can be used on the bus, metro as well as the tram. The entire metro network has been made very accessible for the disabled people. Moreover, on all means of public transportation, a percentage of the seats are left reserved for these people. Passengers travelling with push carts are provided reserved place and are allowed to travel provided with it provided they don’t cause any inconvenience to the other passengers. Those customers who have lost any of their belongings while on board, can approach the lost and found department.